Financial Planning is the process of structuring your personal and business financial affairs effectively, so you will be able to enjoy the life you want to lead in the future and be financially independent. A financial plan creates steps to help you achieve your goals. The financial plan is the blue print to get you started. Your financial planner will keep you on track and help you navigate your way around the curve balls and windfalls that life may blow your way. You do not need lots of money to start a financial plan, just the right attitude. If you look at the pyramid above, the base of the plan is like the foundation of a house. It is important to look at what strategies and structures can protect you and your family from risks such as a major disablement, loss of income, death, the adverse impact of inappropriate business structures and property relationship issues and having your estate planning establish correctly. At the heart of any financial plan is your ‘engine room’ or cash flow. Having discussed your income and expenses with you, we can then advise you on how best to allocate surplus funds towards debt repayment and long term investments according to your personal goals and what you want to achieve. We will also determine future required cash flows for retirement or semi-retirement. 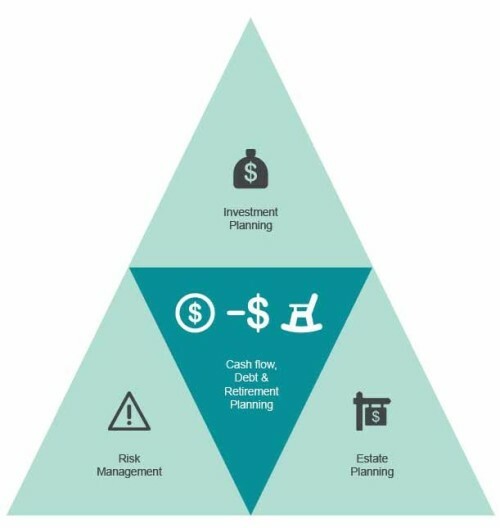 Once your foundation is in place and your ‘engine room’ is running smoothly, the amount required to invest to achieve the financial outcomes to want and the investment solution is determined. We focus on academically researched solutions to ensure that your money is protected and provides you with the growth you need to achieve the life you desire. Remember – life is a journey not a destination and ‘It’s choice, not chance, that determines our destiny.’ Jean Nidetch. For each of the individual areas mentioned above i.e. debt management, retirement planning, estate planning etc. score yourself 1 to 10, where 10 means you have it all sorted, up to date and you are in control; to 1 where you have no control and do not have any idea where you are. You will then see the gaps and weaknesses and can seek advice on the areas you need support with the most.